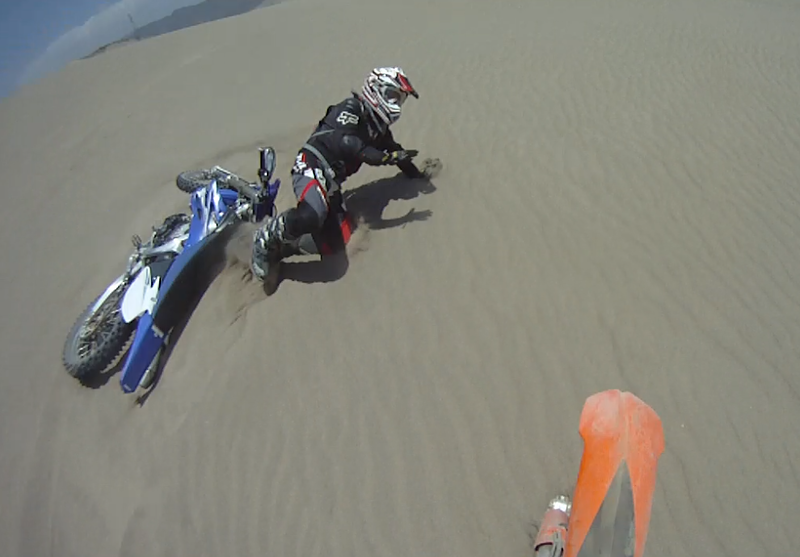 Earlier today (yesterday for you guys) I went on an AWESOME ride with the enduro boys from Lima. Its my first time out since I broke my foot, and even though it still swells quite bit, I can ride and kickstart my bike on it. The first 60km was solo from my house through the desert to get to San Bartolo. There I met up with the usual "enduro Peru" crowd who trailer in their bikes (sissies ) . anything from 50 to 200 riders meet at this garage every Saturday, and ride out in all direction on trips of varying difficulty. I joined a group of five guys who promised they would be "Slow & tranquilo." Well they were absolutely not tranquilo but some of the route I had done before so that was okay. Mountains and dunes, lots and lots of dunes. Okay here they are. I have two vids, both done in different styles, please let me know which one you prefer. Any bright ideas on how to keep the quality of picture high without generating files that are 1Gig? These ones look great on my laptop but especially the first one looks quite kark on youtube. This one is quite dramatic with no less than four spills to keep you entertained. very cool music as well. what are those hills in the 2nd video from? volcanic? and so close to the sea! what made you fall at 5:11 and 6:52 - not enough momentum? was it moerse steep? sounds like not enough RPM maybe? did you mix the music to the video, or vice versa or both? i'd also be interested in hoe to keep the def. when uploading to you tube. Ja some of them are volcanic, but mostly they're just sand covered mountains. Its quite weird for a south african, believe me. In some places theyre very rocky. You cant believe how high some of them get. The Andes mountains literally comes down into the sea here, so once you start climbing you can actualy keep going up until 5,000-6,800m. In the second crash the same thing, I lost power on the steep uphill, but this time pulled the clutch (as you should) but dropped it too fast and spun the bike out from under me. Its was amateur day for me! A bit of both really, first I selected the music for the video, and then cut the video to the music to keep it interesting. It took me hours and hours. I dont know how Michiel does it. What you see is around 2 hous of video cut down to 20 minutes. Do you think it works? Do you want more is it too long? Ja me too. Dont worry about the questions, I'm chuffed someone is interested enough to ask! Was a pleasure to watch, thanks for sharing! That's some awesome, serious countryside! I notice you passed a guy (4:07) on a bicycle! He must have been mad or a German tourist! Actually that was some local on his way to work!!! Although they use other "mas tranquilo" routes most of the time. Neil, I am also learning how to edit and put together videos and my video on youtube with the quad bike racing was just uploaded to Youtube using their software. The 1st upload was also very pixelated like your 1st one. I did a second upload (of the same video)by using Youtubes higher resolution option and that made it a bit better. The second video of Wadi Bih, we used the Quicktime software and that came out so much better in quality. The Sony Vegas Pro editing software is very powerful and gives good results. And I do agree to edit the footage to a watchable length is a tedious process. I have also answered your questions in my Wadi Bih thread. I think the kakkest job in the world must a video editor. Great video! Nice whoops section there. Does you wife know how you ride/crash her bike? It irks me that features in video like whoops, speed and steepness gets lost. The video gives an idea but is nothing like what is happening in real time. I use Windows Live Movie Maker. It is slightly different from what comes with Microsoft but is free an is almost exactly the same in usage. I find that it keeps the resolution better. But, I am looking for better editing software. Just don't feel like paying an arm for it. Page created in 0.885 seconds with 27 queries.